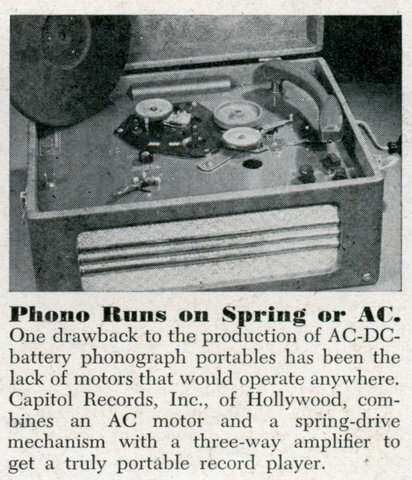 One drawback to the production of AC-DC-battery phonograph portables has been the lack of motors that would operate anywhere. Capitol Records, Inc., of Hollywood, combines an AC motor and a spring-drive mechanism with a three-way amplifier to get a truly portable record player. This must predate wall-warts. These days, the way you make a dual-mode motor is by taking a DC motor and putting some sort of AC->DC adaptor on it.